A top Chinese manufacturer is confident of "catching up with Western rivals and winning the global competition" in the high-end sector despite US President Donald Trump's recent moves targeting Chinese tech products. 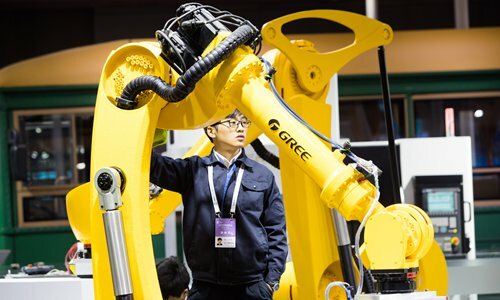 "Some Chinese manufacturers are worried about the impact of the tariffs , but I think the effects will only be short- term, because China is transforming from big manufacturing to strong manufacturing," Dong Mingzhu, chair of Gree Electric Appliances, told the Global Times Sunday on the sidelines of 2018 Boao Forum for Asia (BFA). Florence Verzelen, executive vice president of Dassault Systemes, also told the Global Times on Sunday at the sidelines of BFA that State-owned enterprises are upgrading their product lines. Commenting on US' tariff list, Dong said that it's just another example of how China has been treated unfairly in recent years. Industry insiders said that the tariffs show US fear of China and its growing tech know-how. It is a fear shared by some European political figures, according to media reports, but some executives from leading European firms have expressed different opinions.